Length: 4.5 - 5 "
Habitat: Weedy fields, open areas with scattered trees, woodland edges, roadsides, thickets, shrubby wetlands, residential areas with trees. Diet: Seeds of grasses and trees; thistle, ragweed, and dandelion seeds; buds; some berries and insects. 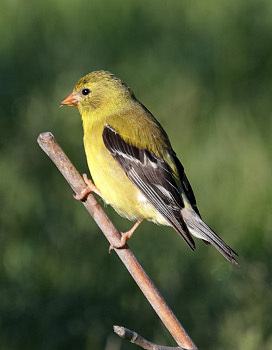 The American Goldfinch is one of the latest songbirds to begin nesting. In New England, breeding usually occurs in the late summer. Since thistle down is commonly used for nest building, breeding typically coincides with the time when thistles produce their seed. Goldfinches are usually monogamous for each breeding season, but will change mates from one year to the next. This bird can be recognized, not only by its bright yellow summer plumage, but also by its roller coaster-like flight. Each time it dips downward, it sings its "per-chick-o-ree" song. 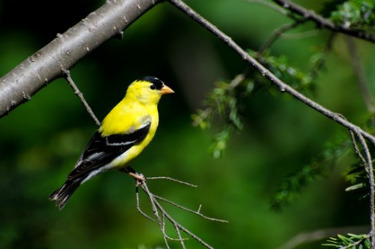 Goldfinches are highly gregarious and will usually flock together during the nonbreeding season. They are often joined by Pine Siskins, Common Redpolls, and American Tree Sparrows.